When writing F# programs, I often write some nice code snippet or some useful helper function that I'd like to share with the F# community. Unfortunately, my blog posts are usually longer and more elaborate, so I never get to blogging about it. Now that I have a twitter (follow me if you don't already) I thought I could just post the snippet somewhere, but there was no good web site for posting F# snippets - until now! 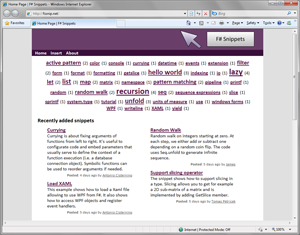 If you can't wait any further, then go directly to the new F# snippets web site at fssnip.net. Add public snippet - If you have any F# snippet that could be generally useful, you can send it as a public snippet. This means that the snippet will be listed on the web site and will be findable using search engines. You'll be asked to add some additional information such as brief description, your name or nickname and a few tags, so that the snippet can be categorized. Private snippets - If you need to share some F# code at Twitter, get a nicely formatted version of code for your blog posts or attach a snippet with proper colorization and tooltips to you answer or question in some forums, you can post it as a private snippet. In this case, it won't be linked from the web site (and you won't have to enter description, your name or tags). You'll still get a nice short URL that you can use to link to your snippet (but you'll have to remember it). When inserting an F# snippet, the web site runs a compiler on the server, which is relatively slow (so please be patient when posting snippets). Unlike for example pastebin.com or similar pages for posting snippets, the web site targets only F#, but it provides some unique F# features. Thanks to Robert Pickering, Antonio Cisternino and James Margetson, the web site already contains a few useful F# snippets in addition to those that I submitted during the development. I think that with your help, the web site can become really useful resource of reusable snippets that solve some of the common problems that F# developers often need to solve. If you ever find yourself thinking that some snippet you just wrote is interesting and could be useful or if you write something when explaining F# to your colleagues, then please go on and post it to the web site! I'm sure I'll do that - I started working on the web site when I got irresistible feeling to share this snippet.